Fellow Team Ping skater, Phil "Smithgrind" Hosey introduces Chris Solomon to the world of skateboard collecting. At the time, Chris had no idea that a person could (a) find all their old skateboards on eBay in almost perfect condition and (b) that a HUGE underground community existed solely for the purpose of skateboard collecting and appreciation of skateboarding's history and art. One day, Phil showed Chris some old decks he had found and sat down and showed him in about ten minutes exactly where to go and what to look for on eBay to find some for himself. In addition, Phil showed Chris a couple of web sites and forums to find other collectors. The seed was planted. December : pre-AoS is born! 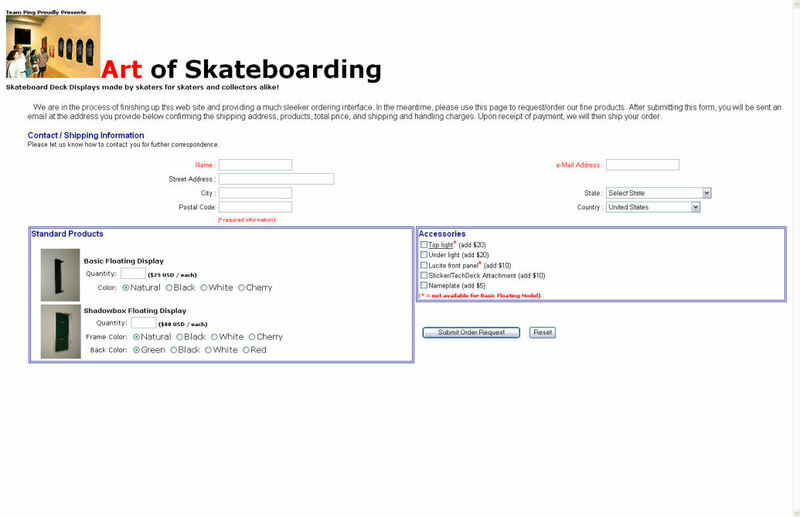 The Art of Skateboarding actually began life as a small part of another web site, TeamPing.com. That web site was built more to document the local, Southern group of skaters that Chris Solomon had grown up with over the years than being any kind of resource for skateboarding collectors. Chris added a kind of "side" area called "Art of Skateboarding" to try to drum up business for some frames and deck holders he was building that were made specifically for skateboard collecting. The idea was to always eventually build a site for "Art of Skateboarding" on it's own, but at that time, there was no real rush...or free time to put into it..
January - March : The "side project" begins with a new mission...thwart evil-doers! March 30th : ArtofSkateboarding.com officially goes LIVE !!! May 23rd : AoS reaches first 100 members ! November 13th : Price Guide hits 4000 items listed! West Coast -> tour of parks starting at "Newberg, OR" and going to Donald, Aumsville, Lincoln City and ending at the famous "Burnside" park with a few side stops along the way. November 11th : ArtofSkateboarding.com moves to it's very own web space ! Originally, AoS was sub-hosted "under" the TeamPing.com web space. Other various small, updates and changes take place over the next months. The site becomes an official company with plans to expand and grow larger. 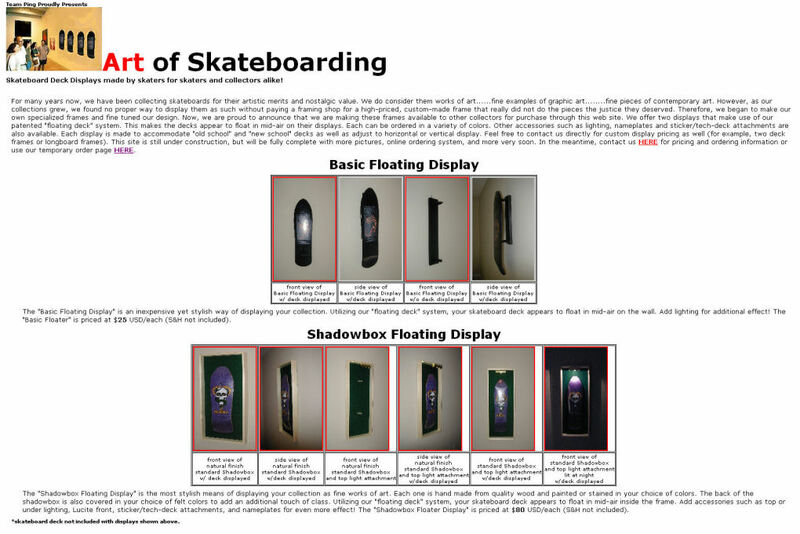 November : AoS in the book "Disposable:A History of Skateboard Art"
Both Chris Solomon and ArtofSkateboarding.com are mentioned and creditted in the book "Disposable:A History of Skateboard Art" by Sean Cliver. Around this time, we first began to have our "403.9" or ""too many users connected" errors. At a little over 15,000 members at the time, it seems our little ol' site had outgrown itself. The poor little Access database and cobbled together code just could not do it anymore. Sooooooo.....efforts were stepped up and schedules adjusted to get to work prnto on a complete site overhaul! Top-to-bottom, re-design, code inspection and new backend MySQL database...along with a lot of new goodies dreamed up to throw in! This marked the beginning of efforts to build "AoS version 2.0"...haha.